Sometimes publishing companies do fun things to get your attention when sending our books. This is the first time I have ever received Pop Rocks. I did what any self-respecting mom would do and I lined my girls up and had them open their mouths. We created a symphony of Pop Rock fizzing and giggles. 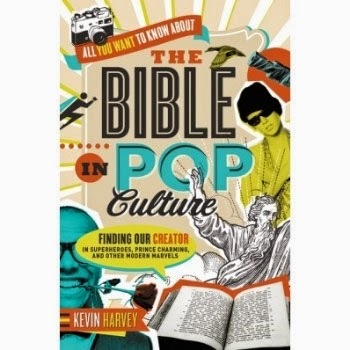 Who knows what to think when you read a synopsis of a book comparing the Bible to pop culture. We are either going to get something really wacky or find something meaningful in the ordinary. I actually thought it was a pretty good. I am sure you could go through and wonder why he is watching some of these shows or movies, but I bet you could do that with any of us. I tried not to look down my nose at anything and just listen to what the man had to say. I enjoyed the fresh perspective and I agree with most of everything he said. I think there is something to be learned in everything. I saw God in super hero movies, sitcoms, and things the likes of Bruce Almighty. Of course there are things wrong with everything in Hollywood. The only place we are going to find a completely accurate account of the gospel is in the gospel. All of these other things are just open doors to discussion. I'm not talking about angry discussion that drives people away. These things are a vehicle to actually sharing the true gospel of grace. Pick up this book. I even learned a few things.